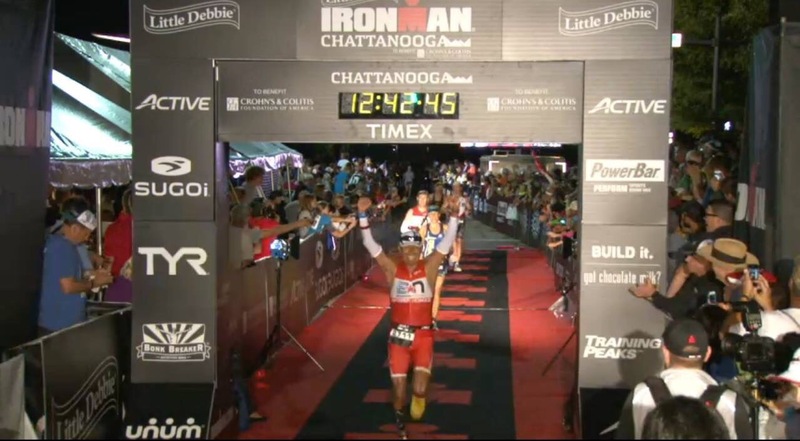 IRONMAN® Chattanooga Race Report: Victor Heredia, 12:10, from IMLT to IMChoo in 6 days! IMChoo was my second first Ironman (after being smoked out from IMLake Tahoe). I think it is appropriate to tell a little bit of my journey to my first Ironman. I signed up for IMLT in March 2014 after a backcountry ski day in Lake Tahoe. The idea of completing an Ironman sounded like a great challenge and a couple of my ski friends were preparing for their first IM. I knew the preparation time was going to be a bit tight for me, as I was doing Boston Marathon in April and I was going to run an ultra marathon (sky running) in the Alps in late June: the Mont Blanc Ultra 80K. I knew I had 12 weeks for my first IM. In early July I could barely swim in a pool and I had no previous real experience on the bike,and never done a triathlon before. My initial goal was to finish strong my first IM. I signed up with EN just before going to Mont Blanc and this was perfect because I new I had the program, the coaching, the knowledge and resources to succeed in my preparation. I trained intensively for 10 weeks. I attended the EN Camp in Lake Tahoe and these 10 weeks were some of the most exciting and transformational periods of my life. I live in Lake Tahoe so I had the perfect conditions to train right where the course was about to happen. Due to the smoke produced by huge fires near Tahoe, the race was cancelled at the moment when we were about to start. I was prepared for this as it was pretty obvious for me that the race could be cancelled. It was pretty surprising to me to see so many people crying on the beach. For me it was a great learning process to be ready for my first IM. Two days later (Tuesday) I got a message from WTC with the option to race IMChoo, IMFL and others. I felt that I had to take the most immediate option to make use of my training and in order to complete my first IM ASAP. I signed up for IMChoo and I had to be ready in just one day to be in Chattanooga. It was very different to have an IM at home than preparing to take all my stuff on the plane. I had to look for a bike case, get a plane ticket, and prepare everything to leave to Chattanooga. Everything went on perfectly. I found out that a friend I met in IMLT from Paraguay was about to drive 1300 miles from Boulder, in order to race IMChoo. He picked me up at the airport and we shared the room. He is a great athlete and even IM Coach. His time was 9:31 at IMChoo. For me he was a perfect companion that helped me with everything, from putting together my bike to little details regarding my preparation. We went out to check the course and even took a swim on Friday before the race. I won´t go into the details of the execution. Although I know it’s all about the execution! The swim was great with the help of the current and the wetsuit. I started in the back after all the non-wetsuit participants jumped into the water. I had studied the course in terms of the fastest and shortest line close to the island, so the swim was a breeze. I concentrated on staying calm, and keep swimming no matter what. I could swim without stopping at all, which was my main victory in the swim. The water felt like a jacuzzi after swimming in Lake Tahoe. The T1 was smooth, could have been faster but I decided to make it slow-smooth. My power computer never synced with the hub. I lost some time trying to fix it with no success. The battery failed. So I didn’t have speed, cadence, HR, nor power meter. I was lost on the ride. I had my 4 EN Keys in mind and tried to make the best out of the whole thing. As I started behind in the swim I ended up riding with slower people as well. I felt really good on the bike. I had my training from Tahoe. I didn´t want to push hard, my goal was to be arrive strong to mile 18 of the run. Nutrition went on well. My intake was 300 cals per hour with good hydration. As I didn´t have my computer, I had to concentrate on listening to my body and enjoying the ride. No huge climbs as I expected in Tahoe. Trying to stay cool and no mistakes. It went on “well”. I was a bit disconnected from the ride. I had neved done such a long ride ever (116 miles). As my ride was slow and as I started the swim in the back, I was way behind in the race. As soon as I started my run, I started counting the people I passed. I did my 30 secs walk on every station, I tried to stay conservative in my run and be calm in the first miles. I concentrated on my pace and form. I paid special attention to my calorie intake and to stay well hydrated along the course. I passed 863 people on the run. Yes. Counting people allowed me to stay focused on the next person I was going to pass. This was not really a great merit, as MOST people were walking, to my surprise! I was passed only by 2 people. I didn’t push too much on the second loop. I saw no point in reducing 5-10 minutes on the run as it wouldn´t have a big impact on my overall result and I could have cramped on the hills in the last part of the race. I knew I was going to meet my initial goals: to finish strong, enjoy the process, and learn from my first IM Race. I really enjoyed this first IM experience. I am so happy I signed up for Chattanooga after being smoked out from Lake Tahoe. I really appreciate the training program, support, and advice from Rich, Patrick and the community. I am in love with the sport now. After 12 weeks since I started my training, I have now a clear idea of what it takes to do an IM and the training process, in order to be well prepared for the next race. I need to focus on cutting 45min to 1 hour on the bike and probably 20 min on the run. My goal for my next IM is to reduce my time by at least 1 hour. I am impressed by the IM community, and I am really grateful to the IMChoo volunteers who were particularly amazing. The journey to become an IM has transformed my life and without doubt I find this is one of the most powerful ways for personal transformation. It has been an amazing way to find the best and highest in myself.